Watch your fingers; this guy is fierce. 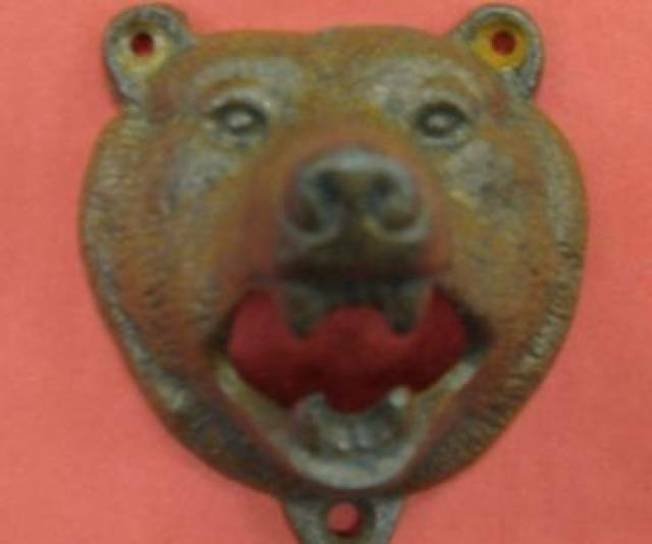 BOTTLE CAP ATTACK: Tough beer caps don't have a chance against this Bear Head Bottle Opener. Its made of cast-iron, and includes a screw mount so you can put it in a place with easy access. $12.50. Available at Hanger 18. MONDAY BLUES: Mondays blow ... we know. But you can always soothe your sorrows with some retail therapy, and now you can do it at Robin Richman. The boutique’s now open Mondays, and starting Nov. 9 get 10 percent off when you stop in on a Monday. 2108 North Damen Ave.
CHILLAXING: Impress your snotty friends with your class when you serve them perfectly chilled wine at your next dinner party with the French Antique Nickel Wine & Champagne Cooler. Or if dinner parties are not quite where you’re at yet in terms of skill set, a cocktail party will do. Get it at Left Bank Jewelry.